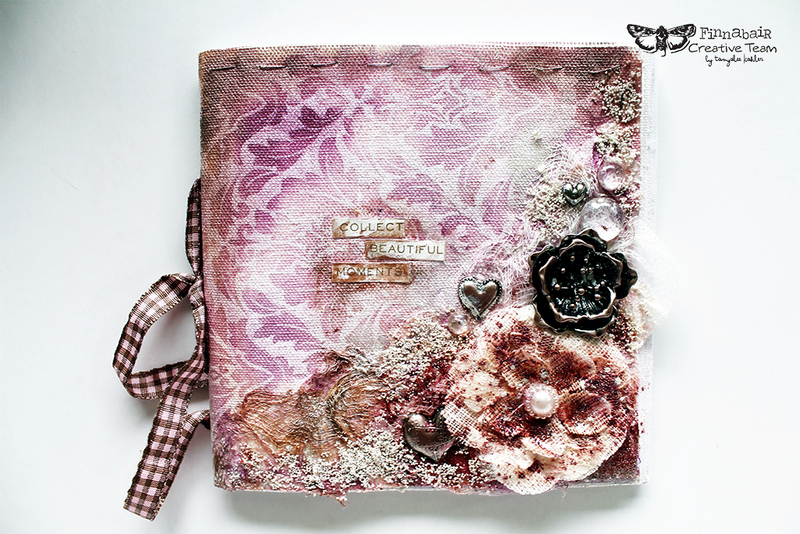 Tanyalee's sharing a great tutorial how to make your own little journal from scratch. You'll see how easy and fun it is to create! 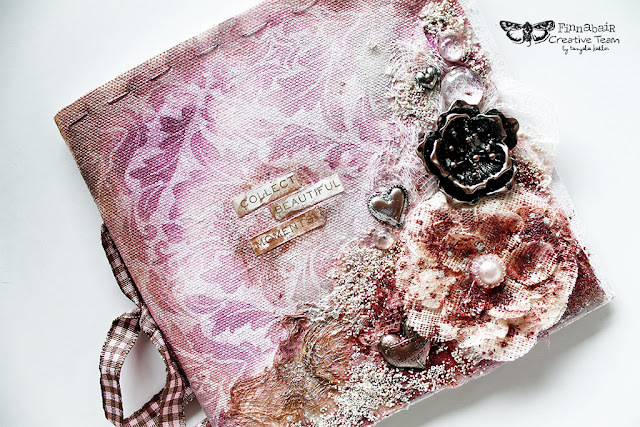 And like always - the possibilities are endless and you can take Tanyalee's creative tips and use them with your favorite colors and your own style. 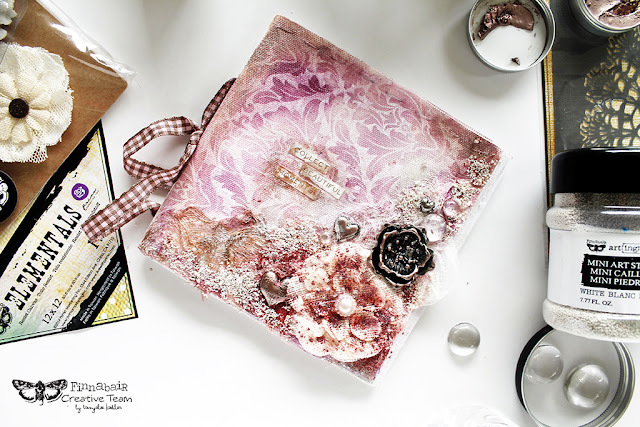 This month my tutorial for you is using Finnabair’s Resist Canvases and I am going to turn them into a journal and then decorate the cover. I selected two resist canvas sheets and cut them down to 6x12 inch pieces so that when they fold in half they will make a 6x6 inch journal. 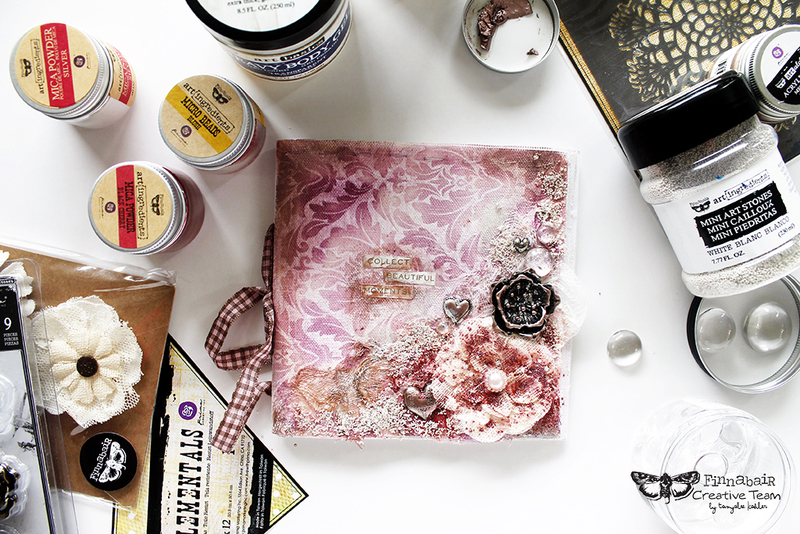 I also added some plain white cardstock for extra pages and to back the resist canvas sheets. For the cover I sewed to pieces of canvas together using a simple running stitch. I was going to machine sew them, but my old sewing machine just didn’t want to do that. It has new entered it’s final resting place I’m sad to say. Once the cover was finished, I backed the remaining canvas with cardstock by glueing the sheets together. I then constructed the journal using a piece of ribbon threaded through two holes in each sheet and tying it off. I started the cover by adding a stencil and some Paper Paste through the 'Doily' stencil. The gauze added texture as well and gave the paint something to soak into and added visual appeal. Next I used the dabbing brush with some Metallique paint in Romance Pink and Soft Satin. I wanted it down in place to allow the resist elements on the canvas to really stand out. 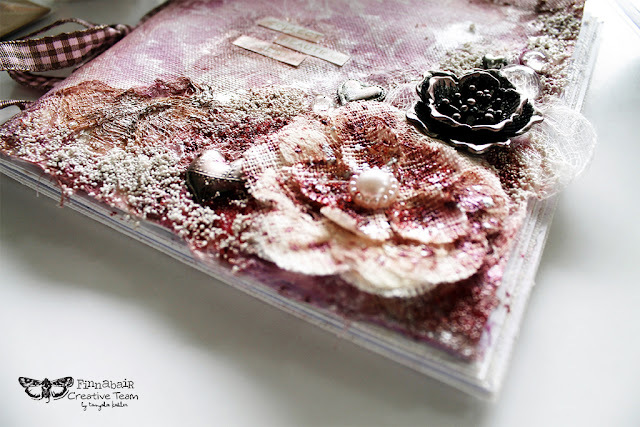 Once the background was painted I started placing the ephemera pieces so that they created an interesting montage, but didn’t end up too bulky so the journal was still workable. I coloured the cover more with Mica Powders and added Mini Art Stones and Micro Beads. As a finishing touch I added some text and rubbed Metallique Wax in Rose Gold over the edges of the journal and the Mechanicals pieces. Please enjoy my video and see step by step how I created my little journal. So GORGEOUS! THX for the tutorial!